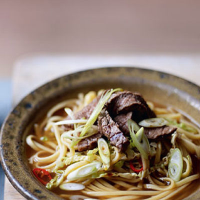 Allow some marinating time I this simple noodle dish. Rub the steak with half the ginger and garlic and the ½ tsp sesame oil, then set aside for 10 minutes. Put the remaining ginger and garlic, the chilli, stock and 1 tbsp soya sauce in a large pan. Bring to a simmer. Add the noodles and cabbage; simmer for 4 minutes or until both are just tender. Meanwhile, heat a griddle pan. Wipe the marinade from the beef; season. Griddle it for about 2 minutes on each side for medium rare; set aside. Lift the noodles and greens into bowls; pour the broth over. Slice the steak and add on top. Scatter over the salad onions and season with the remaining 1 tbsp soya sauce.